"Between The Pipes" is taking you inside Carey Price's game, analyzing it inside and out from a goalie's perspective. Learn all about what he did right and wrong, what he's improved, and what needs a little work on with the starting goaltender of the Montreal Canadiens, Carey Price. Carey Price had a fantastic game Saturday vs the Philadelphia Flyers, with 23 out of 24 saves, and a .957% save percentage. NHL.com even gave Price first star of the game, over Lars Eller who got second star with a goal and an assist, and Brendan Gallagher, who got third star, with also a goal and an assist. There isn't much to critic him on, for his game was close to flawless except for that one goal scored by Vincent Lecalvalier, where there was nothing he could do. 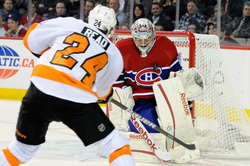 Price had made three stellar saves off the Flyer's power play when a rebound found it's way to Vinny. Brayden Schenn got the puck at the blue line and took a slapper that was an easy right pad stop for Price, but rebound went right on the tape on Lecavalier who made no mistake of putting a wrist shot straight to the back of the net. As I watched on a video, pausing whenever necessary, Price's pads were positioned just right so that the rebound went to the outside, which is what you want of course because if the rebound goes out front, that's where most of the players of the opposing team are so they would easily be able to pick up the rebound for another shot that has scoring potential. In this case, Price did everything right. I blame the defenders for not checking out Lecavalier and being aware of his presence, so that when the shot comes, instead of them all going and looking at the puck, one should've covered Vinny and made sure he didn't have a clear shot. So from my, goalie perspective, Price was doing everything right even with the goal that went in.